(a) When the ignition switch is turned to ON and the rear window defogger switch is pressed, check that the rear window defogger system operates. When cleaning the glass, wipe the glass along the wire using a soft and dry cloth. Take care not to damage the wires. Do not use detergents or glass cleaners that have abrasive ingredients. 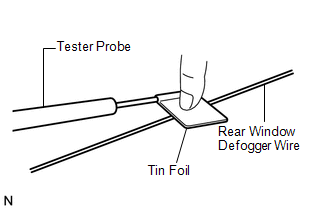 When measuring voltage, wrap a piece of tin foil around the tip of the negative tester probe and press the foil against the wire with your finger, as shown in the illustration. (b) Turn the rear window defogger switch on. 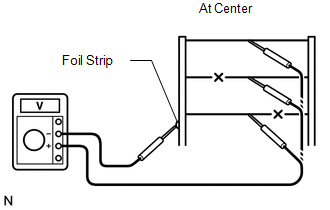 (c) Measure the voltage at the center of each rear window defogger wire to check the wire, as shown in the illustration. If the voltage is 11 to 14 V, the wire may be faulty between the center of the wire and the wire end on the battery side. If the voltage is below 1 V, the wire may be faulty between the center of the wire and the wire end on the ground side. 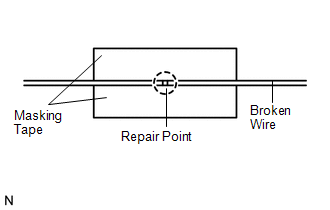 (d) Place a positive (+) lead of the voltmeter against the rear window defogger wire on the battery side. 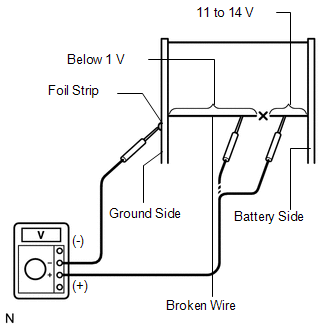 (e) Place a negative (-) lead of the voltmeter with the foil strip against the wire on the ground side. (f) Slide the positive (+) lead from the battery side to the ground side. The point where the voltage drops to below 1 V from 11 to 14 V is the place where the rear window defogger wire is broken. If the rear window defogger wire is not broken, the voltmeter should indicate 11 to 14 V at the battery side. When the positive (+) lead slides to the ground side, the voltage gradually decreases to below 1 V.
(a) Clean the broken wire tips with a grease, wax and silicone remover. (b) Place masking tape along both sides of the wire. (c) Thoroughly mix the repair agent (Dupont paste No. 4817 or equivalent). 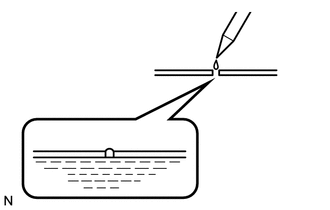 (d) Using a fine tip brush, apply a small amount of the agent to the wire. (e) After a few minutes, remove the masking tape. Do not repair the rear window defogger wire again for at least 24 hours.